Hey hey hey Woohoo for the day! I hope this finds you well! A few blog posts ago, we planned, photographed, and featured our 30th birthday party and we’re happy to share today that it was featured in the Emma Magazine, check it out here! Since this post was originally written in early 2013, tourism has grown to an unruly amount. The space has changed and the amount of tourists coming here each hour is out of control. 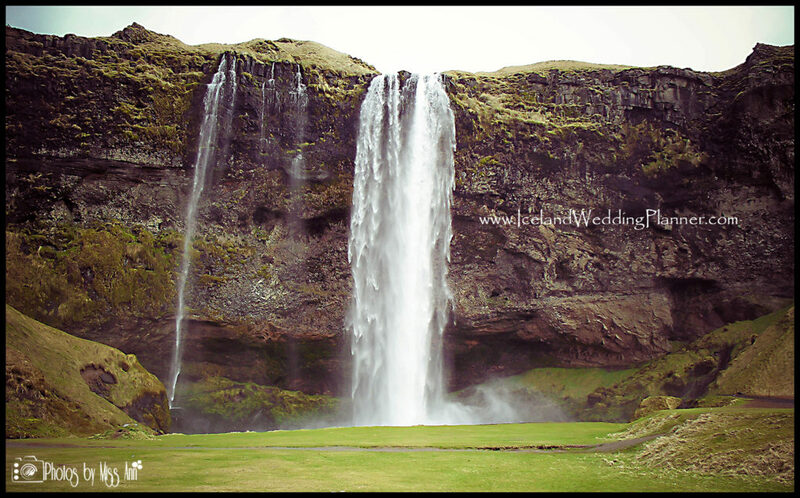 We do not suggest this waterfall as an Iceland wedding location if wanting any sort of intimate feeling ceremony. Now back today’s awesome topic… Waterfalls are one of the most majestic natural wonders on the planet. To be married at one adds in an extraordinary amount of romance and a great start to happily ever after. Waterfalls have symbolized the source of life giving water in many countries. These traits are similar to the symbolic nature of a wedding ring because in many cases it symbolizes the lifeline to a marriage. Iceland is suited for waterfalls because of the consistent snow and rain the country encounters during the year. But the good news is that awesome precipitation adds to the magnificent waterfalls, gorgeous rivers, lakes, and glacier pools that are found throughout Iceland. These elements set the scene for Iceland to be an unforgettable wedding location. Those endless amounts of waterfalls, cliffs, canyons, glaciers, ruggedly unique terrain, and coastlines all create the perfect backdrop for your wedding photos to be unlike any other. Imagine yourself in front of this distinctive landscape saying your vows. It is truly dreamlike! 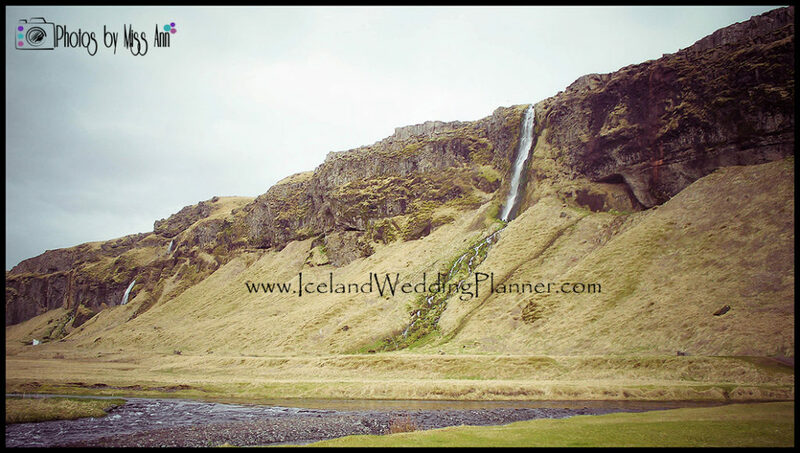 Today, we begin another fabulous 3 part series on Iceland Waterfall Weddings. 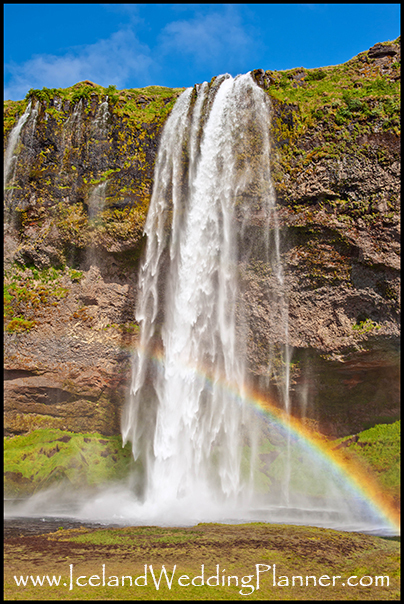 First up is our personal favorite, Seljalandsfoss Waterfall. Enjoy! 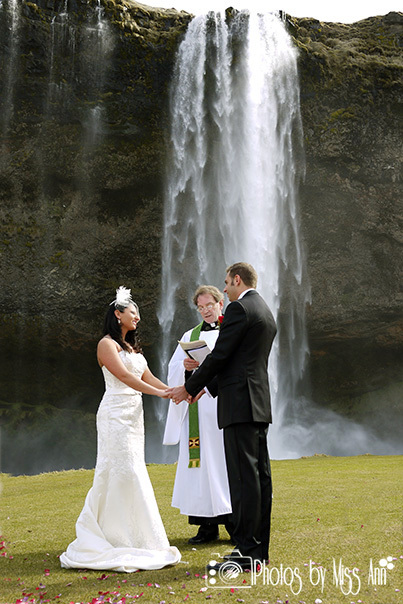 Seljalandsfoss Waterfall is ideal for an adventurous outdoor wedding, engagement session, or simply a post wedding adventure visit. Directions: Once you have passed the city of Hella in Southern Iceland you have about 15-20 minute drive to the waterfall. It lies between the city of Selfoss and Skogafoss. To help pinpoint it, here are the Seljalandsfoss GPS Coordinates: 63°36?57?N19°59?34?W. Consumed by its greatness, you’ll be in awe for a moment or two because you’ll look up and be greeted with 196 feet of sheer natural wonder. Finding yourself completely astounded by the jagged cliffs, grass landings and a cute little bridge. However its greatest secret is a small pathway that leads you up and around the back of the waterfall. If you continue to follow the path, it will loop you around and back to the front of the waterfall. 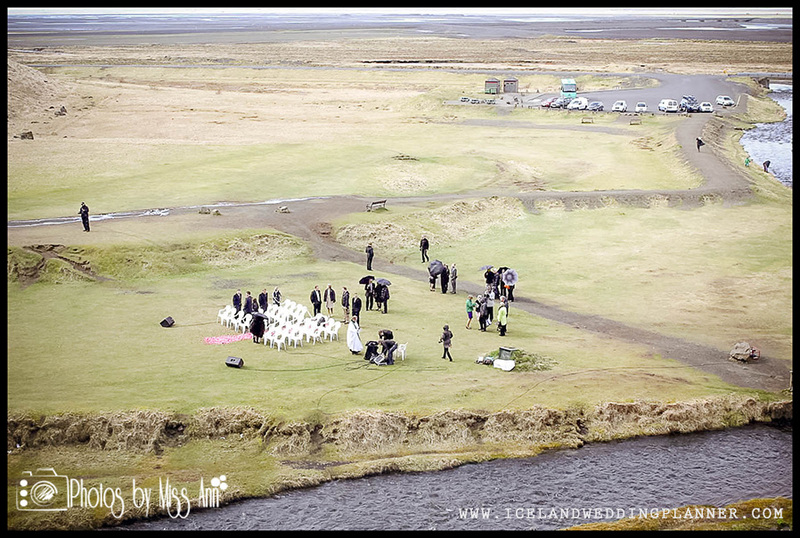 See a view of our Iceland wedding being setup at Seljalandsfoss from the very top waterfall viewing point in the below photos. A few words of advice as you venture in and around this waterfall: If heading behind Seljalandsfoss, shield your camera and bring your raincoat. One gust of wind charging in from the nearby ocean will get you soaked from head to toe. 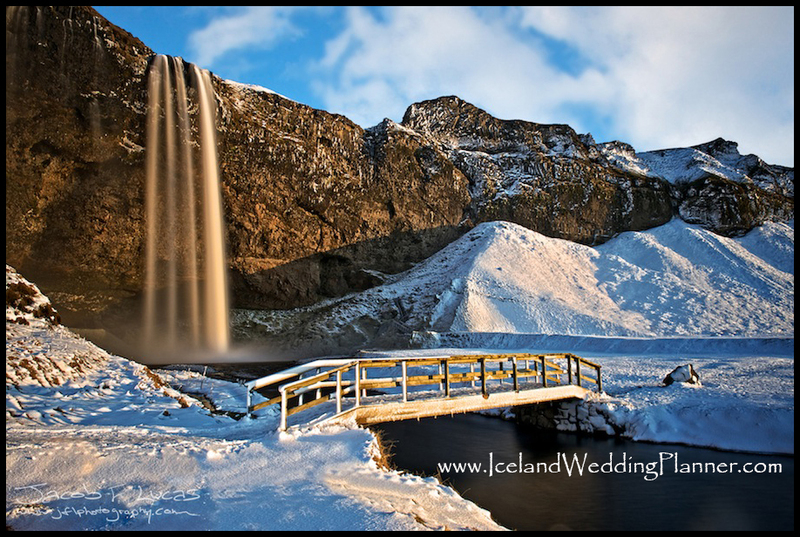 Have your Iceland wedding photographer or Iceland wedding planner scope it out first and direct you. · Gorgeous backdrop for a wedding ceremony and endless unique spots for your Iceland wedding portraits! · It is directly off of main road, Route 1. · You can walk behind this waterfall. 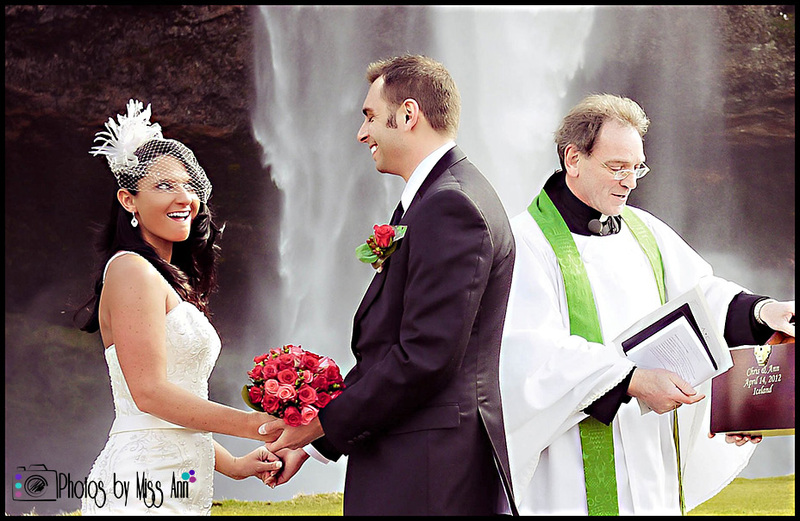 · You can marry right in front of the waterfall. · Beautiful scenery around the waterfall. · There is a cute little stream that runs under a bridge offering a stunning view of the waterfall. · There are no fees or special permission needed to marry here. · The noise the waterfall creates. Consider having an Iceland DJ or some sort of sound system in place. Otherwise your guests will not be able to hear your wedding vows or ceremony over the sound this powerful waterfall creates. · The waterfall is a public attraction so you may have other tourists in your wedding photos. · This spot is also first come first serve, there is no reserving a specific area for your wedding ceremony. 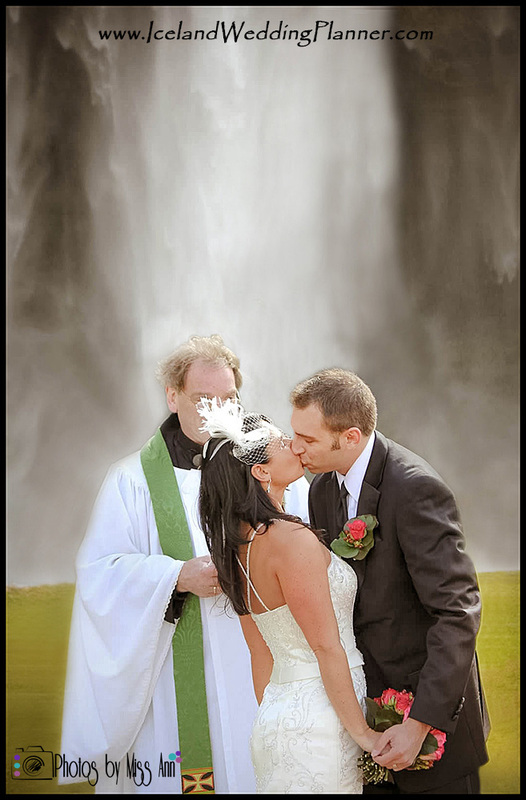 · If holding your ceremony near the front of the waterfall there may be mist and you might get wet. · If you go behind the waterfall you may get wet and the bottom of your dress dirty. Remember how a few blog posts ago I talked about how my husband and I had these “somewhere in time moments” during our magical wedding weekend in Iceland? Well you can add Seljalandsfoss to that list! Both of us will never forget the sound and feel of this waterfall as we said our Iceland wedding vows. Even though we had 40 guests watching us it felt like it was just Chris, myself, and this enormous waterfall as we stated our forever promises to each other. Even over a year later, I remember vividly that Seljalandsfoss provided a total 5 senses experience to us and our guests. Hearing a waterfall now anywhere brings me back to that moment in time. I can even recall how the sun and waterfall mist felt on my skin that day, the earthy smell, and the raw desolate visuals of the landscape that corners the waterfall. 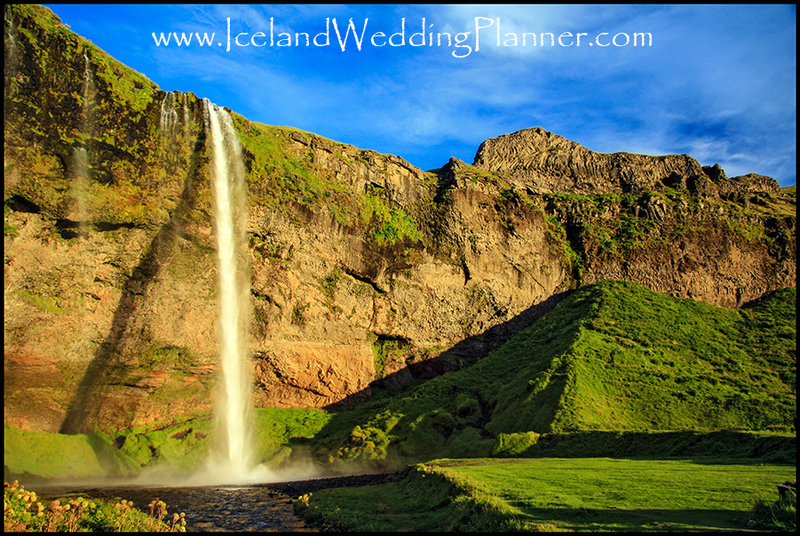 Choosing to have your wedding in front of a waterfall in Iceland is a tall order. Luckily, we’re here to help you –We have firsthand experience! My husband and I were actually married at Seljalandsfoss waterfall on April 14th 2012 (our Iceland destination wedding even made the news, see here). As a husband and wife team, we have wonderful packages that combine Iceland wedding planning, Iceland engagement photos and full day Iceland wedding photography. So please feel free to contact us if you are interested in more details on getting married in Iceland!